I had been looking for a suitable enclosure for one of my Trimble Thunderbolt GPS Disciplined Oscillator (Ref 1) which I bought through a "Group-buy" organized by members of the Time-Nuts mailing list (Ref 2). The "Group-buy" Thunderbolt came with an OEM, 3 outputs brick-style switching power supply. I wanted to integrate it with my GPS Monitor circuit described in another page (Ref 3). This project became obvious when I bought an Extron ADA 3 80 Distribution Amplifier. The Extron ADA 3 80 is described in another page on this site (Ref 4). The Extron ADA 3 80 Distribution Amplifier comes in a relatively large enclosure, which is essentially empty, because all the electronics is on a single PWB along the rear panel. The space left is just enough for a Thunderbolt, its power supply, a small front-panel mounted PWB and display with some room left over for additional circuitry as required (see below). 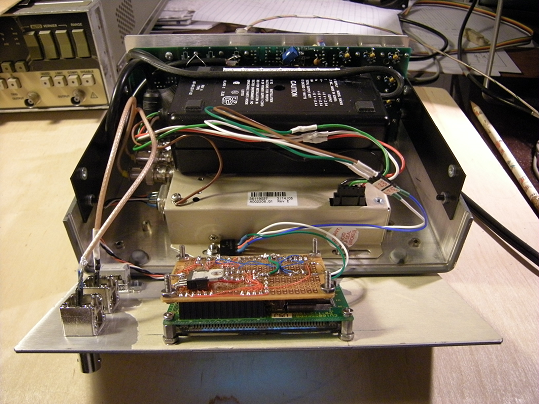 The ADA 3 80 is originally powered through an AC output wall-wart power supply, which is not used in this project. This project is not complete, but it is close enough that I wanted to describe it for those who might be interested in doing something similar. I will update this page as I go. 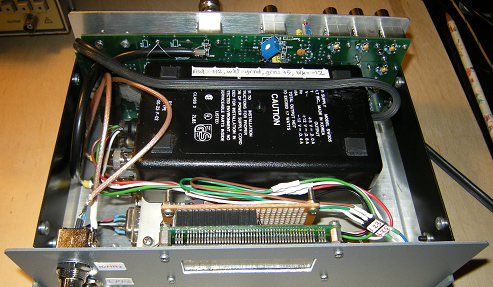 As delivered, the switching power supply would not fit neatly in the enclosure because of the strain relief on the output cable and because it is normally powered through an IEC connector. So the first step was to remove the strain relief on the switching power supply output cable. Then I soldered an AC cord directly to the AC terminals inside the power supply so that I would not have to use an IEC connector. I snaked the AC cord through the opening in the rear panel for the previous power cable. Make sure you use an appropriate strain relief where the AC cord goes through the rear panel. Then I glued the power supply on top of the Thunderbolt and built a spliced wiring harness for the power. The splice is necessary to get the +5 and +/- 12V to the Thunderbolt, and the +12V separately for the display assembly. You will need the +/- 12V also for the distribution amplifier, but I have not done that yet on mine. Note: if you intend to use an LCD display, you can use the 5V from the power brick to power directly the front panel assembly. However, if you want to use a Vacuum Fluorescent Display like I did, the current draw will be too much for the 5V output, so I used the +12V output driving a linear regulator. The 5V linear regulator is bolted to the baseplate using one of the Thunderbolt mounting screw. The 3 terminal voltage regulator visible on the back of the display board is not used. An alternative would be to use a small integrated switcher to convert the 12V to 5V with negligible dissipation. Then the front panel had to be drilled to receive the two BNC connectors and the 9 pin DA-9 connector for the serial port. Short cables had to be made to connect the two BNC connectors from the Thunderbolt to the front panel. At the moment, the distribution amplifier itself is not used. I need to route the power and 10MHz to it. This will require an isolation amplifier between the Thunderbolt and the distribution amplifier. There are suitable examples of isolation amplifiers on Bruce's pages (see below). A Frequency Reference distribution system should use transformer isolated outputs to eliminate ground loops. 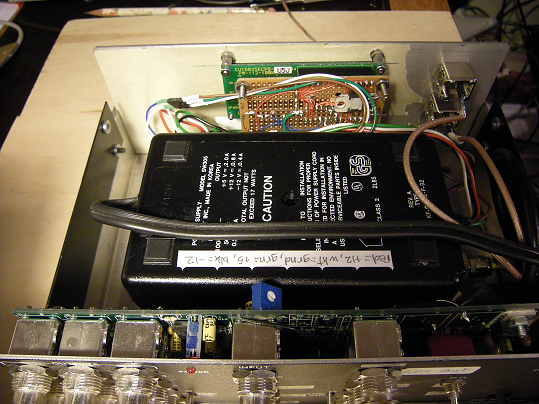 The current metal shell connectors of the Extron ADA 3 80 will be replaced with plastic shell connectors and isolation transformers installed on the back of the PWB. There is not much room, but surface mount low profile 10Base2 or 10BaseT Ethernet transformers should fit. The distribution amplifier was originally designed for video signals, and therefore has much wider bandwidth than necessary for a 10 MHz reference distribution system, which will cause increased noise level. Fortunately, the actual circuit of the Extron Distribution Amplifier is very similar to the one described by Bruce Griffiths in his Timing pages (Ref 5), so it should be sufficient to change the feedback and coupling capacitor values to get pretty close to Bruce's circuit. In my intended application, some outputs will be used for precision timing but others will be used simply for frequency reference for lab equipment, and therefore do not have the same requirement for low noise. It is my intention to optimize one set of outputs for very low noise while the others will remain closer to the original design for simplification. 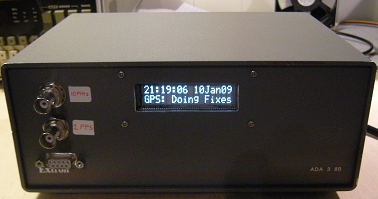 The serial port connector on the front panel is not yet wired.